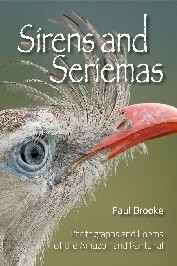 With Sirens and Seriemas Paul Brookes explores the wild places of Brazil through photographs and poetry. A former biologist and naturalist, Brooke travelled the Amazon and Pantanal regions of Brazil studying culture, history and natural history. The poems address pressing environmental issues such as deforestation, extinction, overhunting, overpopulation, urbanization and wildness. The photographs chronicle the amazing beauty and danger, the culture of Amazonian peoples and multicoloured landscapes. or hung dangling from thatch. iridescence, and oo and ah. like little scraps of paper. seems to be a handmade hat. Or a pistachio ice cream cone. only myself for this foolishness. A practical guide on how to create a pond in your garden, big or small. A Bird book with a difference: it rhymes. The complete field, identification and site guide to the Butterfly species, subspecies and forms in full colour. © Copyright 2019 Brambleby Books. All Right Reserved. Website produced by 21st Century New Media Ltd.